This stylish design has been crafted with extra care and the top quality material has been used to gives you the stunning jewelry piece that can add spark to your look and amaze others by your style sense. BlingSoul gets the inspiration of this classic bracelet from your favorite Movie. It will grab everyone's attention and show your style sense to everyone in the fashion world. You can wear it in any occasion like casual hangouts, costume parties or formal gatherings as well. Time to refresh your memories with some unique stranger things jewelry piece - Ideal birthday gift for all the jewelry lovers. 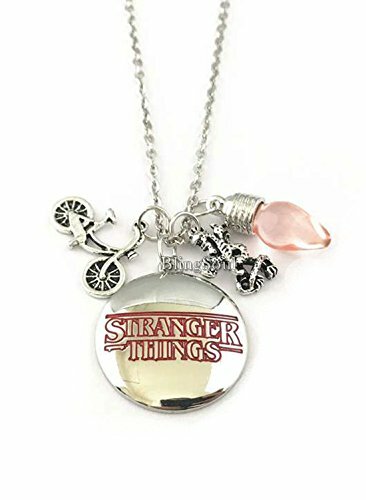 This Stranger things necklace will give Luxurious looks makes it easy to wear for every occasion and it can be used by everyone from child to adult. This premium stranger thing merchandise gives attractive look which definitely capture's your friends' attention. It is elegant enough that you can wear it with your casual as well as formal attire.